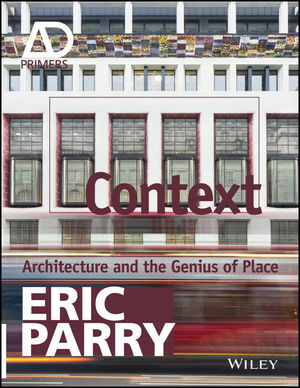 Context-Architecture and the Genius of Place is a highly engaging, informative discussion of context in architectural theory and practice. Eric Parry, one of the UK's most highly regarded architects — whose work has been widely lauded for its innovative response to its setting — addresses the contemporary definition of context and its importance for sustainable everyday living and urban design. Looking beyond the formal agenda to explore the fundamentals that give new social and cultural perspective to this vital point of departure for designers, this book turns the urban statistician's telescopic focus on global trends inside out for a better understanding of the cultural and physical conditions that make archetypes like the Parisian Café, the London High Street, the Baltic City Square, and the Mumbai Market part of the architect's lexicon. From pavement to landscape, readers will examine how context must be taken into account at every stage in the design process. This book draws on the author's extensive experience within complex urban settings to show how the existing fabric and social conditions can provide an essential starting point for new design, offering a framework for thinking about design responses and their relationship to cultural origins of place. Whereas existing urban settings, particularly historic city centers, are generally regarded as limiting to architectural creativity, this book presents context as grounds for inspiration rather than constraint. When used correctly, these techniques create the feeling that a new building has always been there, simply because it "fits". Context explains the methods behind brilliant architecture, helping designers create buildings that not only belong, but can provide a catalyst to urban life. Eric Parry leads one of London's most eminent practices, Eric Parry Architects, which is renowned for delivering beautifully crafted and well-considered buildings. He is a Royal Academician (RA) and is on the Royal Academy Architecture Committee. He is also on the Mayor's Design Advisory Panel. In addition to his work in architectural practice, Eric has held a number of distinguished positions, including President of the Architectural Association. He has in the past served on the Arts Council of England's Visual Arts and Architecture panel and chaired the RIBA Awards Group. His contribution to academia includes a number of years as Lecturer in Architecture at the University of Cambridge and lectureships at the Graduate Design School, Harvard University and the Tokyo Institute of Technology. Eric speaks at conferences worldwide and lectures internationally.